For the third time in a single year, quite a rarity on the ol' calendar, we get to experience a Friday the 13th. I'm not a very superstitious person myself, so this doesn't phase me in the slightest. If anything, I actually tend to find Friday the 13th to be a really positive day for me - or at least not one that differs from your run-of-the-mill Friday. Presently my mind is focused far less on bad luck and suspicious mojo and much more on the fact that we are really and truly into comfort food season once again. Winter may still technically be more than a month away, but in Canada it might as well start on November 1st for all intents, because once Halloween wraps up, most of us switch into winter holiday mode and the weather tends to take a substantial nose dive early in November as well. Not always, and certainly more so in some parts of the country than others, but in general, yep, November = the start of winter here. I'm a huge fan of comfort food, of gathering friends and family around the table and satiating our bellies and souls alike with food so delicious you nearly tear up with joy as you smell it cooking. Food that evokes thoughts of cozy autumns and icy winters past, of childhood memories, and sometimes of places we've traveled to throughout our lives as well. Such food doesn't have to be an epic calorie feast either, but sometimes it is, and there's nothing wrong in the slightest with that (at least once in while!). We need the extra fuel to stay warm and stave off winter's energy zapping chill. Today's vintage recipe falls somewhere in the middle I think, though it could be more or less of a treat, just depending on what you put inside it. This 1950s recipe for Chili or Stew Casserole is dead simple to make and isn't too hard on the wallet either, especially if you put existing leftovers to work in it. One of the great things about this recipe is that it can easily be made vegetarian or vegan, if so desired (simply omit meat and/or other animal products), and you can also use a good all-purpose gluten-free flour for the topping. I've made GF versions of this recipe numerous times and it always comes out aces! You can also swap out the regular potatoes for cooked yams, sweet potatoes, mashed turnips, hearty squash or pumpkin verities, mashed (and drained) cauliflower or broccoli, carrots or, one of my personal favourites, parsnips. Likewise, as with many casseroles - and this is certainly one of their most appealing qualities - you can add or subtract from the filling, if so desired (for example, you add further cooked chopped veggies to stretch out a small amount of leftover stew or chili). This dish is also nice, especially if you're using chili for it, topped with a little grated cheese before you put it in to oven to bake. They're not everyone's cup of tea by any means, I fully understand. No worries at all there, sweet gal. In my family, only my maternal grandma and I are die-hard fans. The weather here is soooo grey today and there's a light Scotch mist falling. It's truly the perfect day for a hearty casserole and I think I'll slip one in the oven so that it's ready for when Tony gets home from this week's business trip in the early evening hours. HAven't made a caccerole in forever…. Do you have a favourite type of casserole? I'm especially partial to shepherd's pie myself, but in general really like this classic type of food and am happy the the season for it is here again. Have a stellar weekend, my friend! Same here, sweet Beverly, especially with my paternal grandma. Her kitchen always smelled scrumptious and you were never going to go hungry when she was around. To this day many culinary scents still whisk me straight back there at the speed of light. Wishing you a fun filled weekend! I'm revamping my Thanksgiving meal to include two Southern style casseroles -- one a cauliflower au gratin and the other a butternut squash casserole. My Mom used to make casseroles all the time. They're easy to make, take no time at all to put together, require a small amount of ingredients, and can feed an army, which we were. And the left overs are DIVINE! :) Cream of chicken soup was a household staple. Giant yums!!! I adore squash and pumpkin dishes, too. It sounds like your Thanksgiving feast is going to be lip-lickingly awesome. but is this mexican casserole in the ad fabulous?!! It definitely is! A great fusion of cuisines before such a much celebrated way of cooking. Great point about how using the oven keeps our homes extra toasty during the winter months. That's certainly another wonderful element to casserole cooking. Happiest weekend wishes, dear Beate! Happy Friday the Thirteenth! Like most modern events, there's an inversion of previous non-Christian holidays and celebrations. The thirteenth used to be considered especially lucky. Thank you very much, Ally. I've had a lovely day - as Friday the 13ths usually are for me - and have spent it primarily working on this year's Vintage Holiday Gift Guide post for a bit later in the month. I love these kinds of recipes - great for leftovers! I'm picturing it with some of the goodies from Thanksgiving dinner, and it's definitely taking me to a happy place. I don't do casseroles very often, but I would like to start incorporating them into my cooking repertoire more often. I have a nice slow cooker, I should look up some slow cooker casserole recipes sometime. Aren't they though! Great suggestion about using Thanksgiving leftovers in a dish like this. I usually like to make a stew or soup and a casserole or pot pie with ours as well. It's amazing how slow cooker recipes have gone through a major renaissance in recent years. We're seeing not only old classics, but tons of great new spins on cooking with this handy appliance as well. I hope you're able to find oodles of them that you enjoy. Big hugs & happy Thanksgiving season wishes! Sounds like a perfect comfort dish for a cosy winter stay in night. And I love casserole meals so much! Have a wonderful weekend! Thank you very much, sweet lady. I had a fantastic weekend and all signs point to the second half of the month being that way in general, so I'm really excited for it. I hope that yours was lovely, too. Mmmmmm sounds just like something my grandmother used to make. Yum!! Same here! :) My paternal grandma made some truly scrumptious casseroles when I was growing up (as did my mom). They were such a mainstay of her generation and I love that she kept on creating them for decades to come. 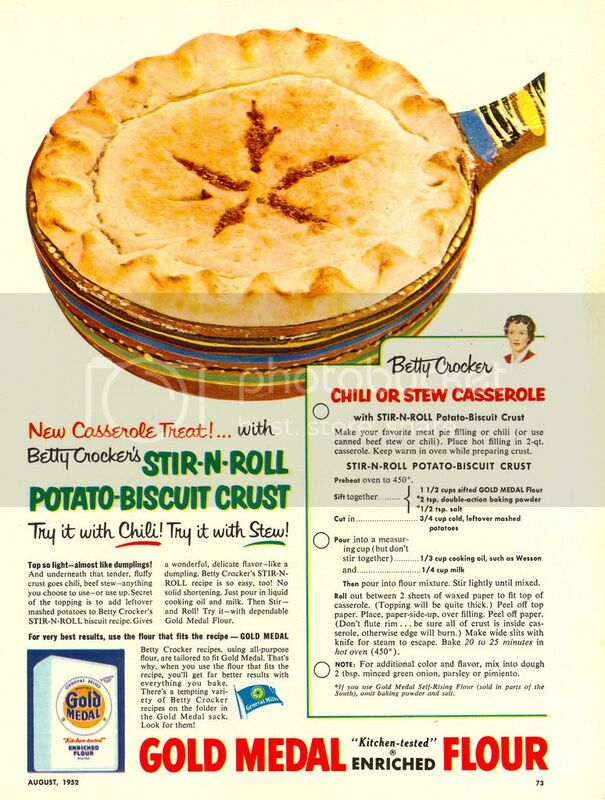 I'm sure they helped foster my love for mid-century recipes all the more. You're very welcome, dear Serena. Thank you very much for all of your awesome blog comments this month. I truly appreciate each and every one of them. Parsnips! Delicious! Quite my favourite! I do like autumn and winter for hearty comfort food featuring a root vegetable or two! Same here!!! I just held a lovely little family dinner party at our place last night and while parsnips weren't on the menu this time, another cold weather staple, sweet potatoes (that I slow roasted with fresh thyme, cracked black pepper, sea salt, onions, and brown sugar) were. They sound delicious! Sweet potatoes get almost as much love from me as parsnips do! Wishing you a fantastic Sunday & week ahead! Intriguing! Over here, pubs often serve pies that are basically a dish of filling with a pastry top, but I've never seen one with potato in. Thanks for your lovely comment. Have a fantastic weekend!